'Tis the season means it takes a little while to get through books. I just received Anne Cleeland's latest book, Murder in Hindsight. She's going to kick off the 2016 book giveaways by giving away all three books in her Scotland Yard mystery series. And, I'm excited about that. But, I'm one of those people who has to start at the beginning of a series, and I haven't read the earlier books. 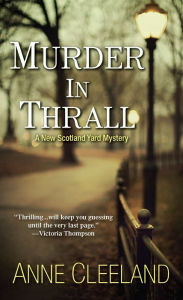 So, I just started Murder in Thrall, the book that introduces Detective Constable Kathleen Doyle and Chief Inspector Michael Sinclair, Lord Acton. But, no promises as to how far I'll get tonight. So, since we may have to save a discussion of what we're reading for tomorrow, I'm going to throw out another question today. Tell me about a mystery series you read that requires the reader start from the beginning. I know sometimes fans sometimes recommend new readers start at a later book because the author improves. Tell me which one must be started from book one. You know my opinion-EVERY series should be started at the beginning. I prefer to read from the first book in a series, but sometimes don't, not always knowingly. I know you're a huge Louise Penny fan as I am, so you can understand that it is best to start with Still Life. Really, all cozy mysteries because it's mainly about the characters and characters change over time. If the writing gets better as the series progresses, all the better. What Christie said. In this day and age I agree. But you want names? Peter Robinson, Michael Connelly, Marcia Muller, Margaret Maron, Cynthia Harrod-Eagles, Colin Cotterill, to name a handful. Start at the beginning and continue from there. There's an old series by Charlotte MacLeod about an impoverished Bostonian named Sarah Kelling who turns her late husband's home into a boarding house. The first book is The Family Vault. It serves to introduce her eccentric relatives, most of whom figure into the subsequent books. I guess it's an early cozy series, and I always found the books delightful. OH! I love this new series by Anne Cleeland! Love it to the moon and back. One series that really does need to read from Book One is Louise Penny's series (and she will tell you that also). I would recommend both Margaret Maron's series being read from the beginning. Actually, I agree with all of you that series need to be read from the beginning, but there have been times I've picked up a later book for various reasons. But, I love to see your answers! I'm not sure I've ever read a series in order. Usually, I find a book in a store that appeals to me, and it's the 3 or 4 in the series. Serendipity, Glen. An entirely different way of discovering books. And, perhaps you discover more than those of us who "have" to read series books in order. Back in the early 1970s when I first start reading mysteries in bulk I'd read books whenever I could find them, hence reading in any order. This didn't matter for the most part with Agatha Christie (mostly - I did read NEMESIS before A CARIBBEAN MYSTERY) but occasionally it cost me, as in reading some of McBain's 87th Precinct books out of order. It is hard enough to keep Bert Kling's love life straight when you read them in the right order. The one that really tore it was reading the last Van Der Valk book by Nicolas Freeling first! I still did go back and read the rest of the series but that was really dumb. I also prefer to read series in order. Any time I read a review here that I want to read I jump to Goodreads to find the first in the series, then try to put a hold on it at the library or buy it. The series that I think especially need to be in order are Dana Stabenow's Kate Shugak series, Craig Johnson's Walt Longmire series, Julia Spencer Fleming's Claire and Russ series, Tony Hillerman's Chee and Leaphorn series.